I often see riders peek at their wrists to check on their heart rate. It’s important to realize heart rate is a reaction to the work being done, not necessarily a reflection of how much work you are doing. The more fit you are, the lower your heart rate. Too many people associate breathing hard with working hard . . . NOT SO! In order for heart rate data to be meaningful, you first need to know your maximum heart rate, MAX HR, the highest number of times your heart can safely beat in one minute helps calculate your heart rate zones. Heart rate zones help you approximate effort. Cuz when the instructor says: “This should feel like a 7 out of 10” is really vague. 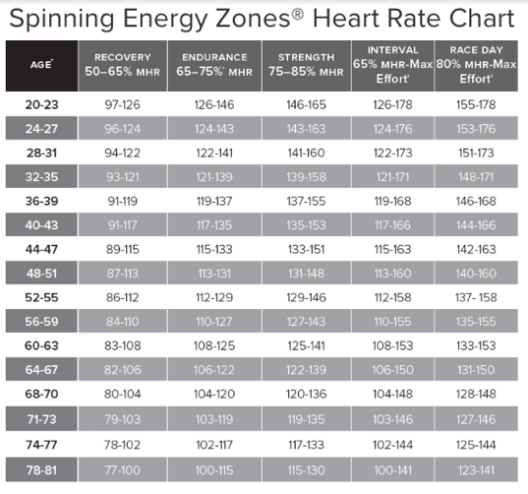 Spinning.com provides a chart based on heart rate and age. I kinda skipped the part about needing a heart rate monitor . . . Wahoo has a fantastic device (check out the Tickr X -- it even tracks cadence!) and many fitness trackers monitor heart rate. Some models even connect to mobile apps (iOS, Android). If you aren’t training with heart rate, it’s mostly a guessing game. SO STEP UP YOUR GAME IN 2019, use heart rate to determine effort The instructor kudos will always be there … I PROMISE!